1992 Challenge of Champions . Aug. 29, 1992 . Las Vegas, Nev.
Johnny Archer makes his third appearance in our countdown of the top 30 final matches of the last 30 years. This was one of the times the Scorpion was on the wrong side of the barnburner. The 1992 Challenge of Champions, a short-race, single-elimination, winner-take-all $50,000 event - just as it is these days - set the stage for a wild final between Archer and Buddy Hall. In front of ESPN cameras, eight of the day's top professional 9-ballers chalked up with the hopes the TV-friendly format could give pool a mainstream audience. 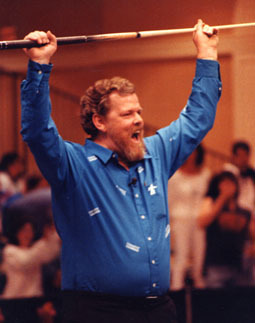 In the Mirage Casino in Las Vegas, the Challenge featured a raucous crowd of amateurs in town for the Bud Light Pool League team championships. The quarterfinals were a single race-to-5. The semis and final then featured two race-to-5 sets, with one sudden-death rack if - and hopefully when - each player took one set. In the Hall-Archer final, each player made a run in the first set, partly due to the alternate-break format. Hall won three straight to take his only lead at 3-2. Archer then took control of the opening frame. He captured the first set by winning three straight, including two break and runs. The top-ranked player on the PBTA, the 23-year-old Archer appeared to be cruising to the hefty payday. IN the second set, he won another three racks for a 3-0 lead. But Hall came roaring back. The Rifleman took advantage of two miscues from Archer and eventually worked his way onto the hill, 4-4. Archer had the break knowing that a runout would be worth $50,000. He pocketed the 1 on the snap, but was forced to play safe. Hall tried to kick the 1 to the opposite side of the table but left a makeable shot. Archer again had the $50K in his grasp, but, with just three balls left, he lost control of the cue ball, letting it skid into the 8. His only option was a kick 7-9 combo. Hall lucked into a second chance at $50,000. Archer bounced the 9 off two rails and into the corner pocket opposite his intended target. That would have been great in just about any other event, but every 9 had to be called at the Challenge. Event officials, including referee Pat Fleming, judged that the 9 would be spotted and Hall would shoot. The big Kentuckian cleared the table to force one rack for all of the cash. Archer won the lag by a hair for another chance to run out the winning rack. He again dropped the 1, but missed a flier of a 2-9 combo. After an extended safety battle, Archer double-kissed the 3. Hall had an open table and the boisterous crowd behind him. He coolly ran out the rack, while Archer was left in his chair, mouthing "I can't believe it" to the crowd. "They're going to start calling me 'Houdini,'" Hall said after the match. "I was done. Then when I saw that cue ball skid on Johnny, it felt like the Lord stuck his hand down and pulled me up."